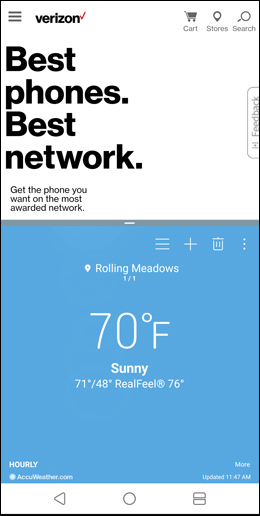 Multi window view allows two apps to be open on in split screen at the same time. When enabled, apps automatically open in Multi window view. The apps must support Multi window to use this option. To launch the Multi window view, touch and hold the Recent apps icon (lower-right). When the split screen opens, tap the second app you want in Multi window view. The image below is an example of Multi window. To close Multi window, touch and hold the Multi window icon (lower-right) from any screen.